Aiguablava is a sandy beach located in the municipality of Begur, but just on from Tamariu. 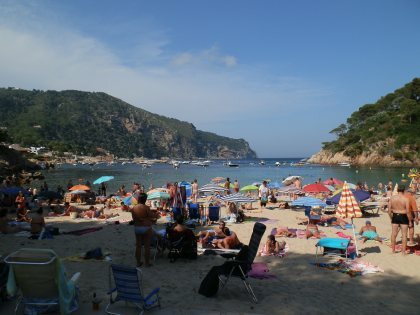 The beach is famous in that it is used as the poster-image for this part of the Costa Brava with sheltered clear turquoise sea under the cliffs and soft golden sand beach. The beach itself sits below a Parador (a type of luxury historic hotel run by the Spanish government), with rocky inlets to the left as you look out to sea and around a couple of these coves you come to Fornells, a tiny but exquisite fisherman's village with two hotels. During summer the bays fill up with luxury boats and yachts both for the scenery, the sheltered harbour and the quality of the swimming and water. One of the best features is the view across to the headland of Begur. As a result Aiguablava can get very popular (and crowded) at the height of summer. Almost the only way to reach the bay is by car which can make parking tricky. The beach does not have a village as such around it. Instead there is just a car park, then as you get down towards the sand there are a small number of seasonal bars and restaurants right on the beach some of which are only accessible across the sand. The bay is marked off for swimming and there is a lifeguard service. However, one of the attractions is that it's easy for experienced swimmers to swim into the other bays or even all the way round to Fornells. There is a canoe and pedalo hire station to the right hand side. The area would be excellent for canoeing around the bays and cliffs. The beach itself has a fine sand which is soft between the toes. It would be perfect for making sand castles, but it can get busy and tightly packed during the peak season. The neighbouring bay to the left, reachable walking over the cliff to the left, is an entirely pebble beach. The bays near Fornells are sandy but tiny with barely enough space for more than 2 or 3 families. Platja Fondo further round will be covered later. Swimming is wonderful, though the water can get cloudy when the beach is really busy. For children the main beach shelves gently into the water and is mainly a clear sandy bottom, though the centre part has a line of pebbles just as you enter the water (the extreme left and right are softer). The exception are the rocky areas to either side with boulders and giant stones in the water teeming with fish. As mentioned, for a good swimmer there should be no problem swimming all the way across to Fornells. Each of the small bays is relatively rocky below the surface and there is excellent visibility for shoals of fish or other aquatic life. The only slight downside is that you have swim outside the protected area and among the boats. But mostly they are stationary and there shouldn't be any problem - certainly many people swim directly from the boats. If Fornells is too far, then there is also good snorkelling in the area to the right and some caves in the rocks that are only accessible from the water. Parking can be difficult during the height of summer. The car park directly at the back has parking meters so you will have to pay (and a theoretical maximum time limit so you might need to re-ticket the car). In these sorts of places in the height of summer you can be pretty much guaranteed there will be ticket wardens around. Unfortunately the car park does fill up, and many people park on the road at the top, but again space can be limited. For this reason getting there either early-ish in the morning, or alternatively later in the evening are recommended. The GR92 runs past Aiguablava and the walk up the cliff to the left will take you right round to Fornells and ultimately onwards and upwards to Begur. In the other direction the GR92 runs away from the coast to Tamariu - it's a relatively steep climb though.